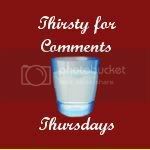 Acting Balanced: Thirsty for Thursdays - Link up a post and comment away! Thirsty for Thursdays - Link up a post and comment away! Get comfy, grab your favorite hot or cold beverage, link up a great post from this week (or even earlier) and visit some other great blogs to comment!